Deonte Burton: Pardon the over-generalizing–it’s all we have with the YouTube theory and a few summer sessions watching him last year–but Burton is a one-trick pony to date. From everything I’ve seen, this is a super-talented player who gets to the rim with ease and finishes with Darius Johnson-Odom-like power (see for yourself). Right now he needs work on his outside shot, really needs work on his off-hand and, as 6-foot-4 forward-type, needs to find his role. Buzz Williams must be salivating over his options on how to mold Burton, and for now I’ll say his biggest improvement must come with his right-handed dribble. He’s a fantastic slasher, but the scouting report will be written quickly if he can’t go right. That being said, the possibilities on how to utilize him are endless. He’s switchable-like in that sense. Davante Gardner: If you would have told me in October 2012 that Gardner would be the exact same player in his junior year that he was as a sophomore, I would have had serious doubts about his progress. But Gardner isn’t changing as he continues to put up improved numbers; that’s easy to see. And I won’t take the cheap route and say his conditioning must improve because he is who he is–a 265-pound Davante Gardner wouldn’t be as efficient. What we’d like to see is a 15-foot jump shot become an option. It never will be a significant part of his game–again, he is who he is–but if he can be a threat from somewhere other than the low blocks, it opens up that area for a Jamil Wilson or a Steve Taylor to run the baseline. More than anyone else, Gardner’s progress helps others. Jameel McKay: Having seen a few Indian Hills games/highlight tapes, let me be the first to say McKay’s inside game is a beauty to behold. Despite his wiry frame–he’s listed at 205 pounds–he positions himself well, has a stellar vertical and is relentless on the glass. He admittedly needs work on his jump shot, and it’s something he worked on all spring. After all, Marquette has efficient players around the rim in Davante Gardner, Chris Otule and Steve Taylor; McKay is just house money in that department. What’s going to make him different is that 15-footer and outside shot. If it’s there–and I personally think it will be–he’s going to be a crucial part of Buzz Williams’ rotation. Chris Otule: What an inspiring season the fifth-year senior had, returning from a torn ACL to become Marquette’s top interior defender and most improvement inside scorer. 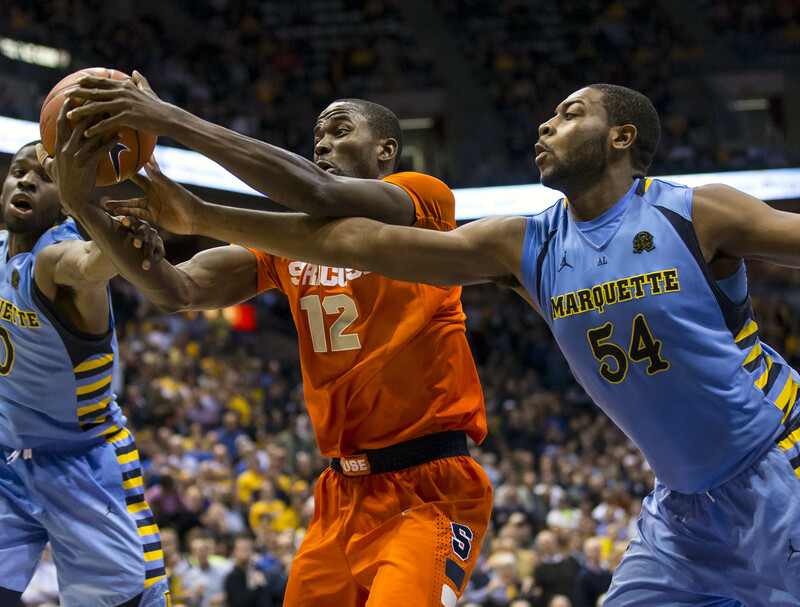 Since he’s as seasoned a player as Marquette has, there isn’t all that much he can improve on. That is, outside of being more consistent in his defensive rotations. Otule’s wide frame allowed him to dominate most opponents in one-on-one post situations, however he rarely was able to recover help-side and block/contest shots. Surely the ACL surgery and recovery limited him in that area, but if he’s able to continue strengthening the knee and work on his lateral movement, watch out for the 6-foot-11 monster inside. Steve Taylor: Knee surgery will limit Marquette’s impressive freshman, and his summer may be a lost cause unless he’s able to return ahead of schedule. When he does make his return, however, he’ll need to see a fire lit underneath him. The talent is unquestionably there, and if the soft-spoken switchable can just show a bit more aggressiveness in his game the returns could be incredible. This may not be something he can actually work on, but hopefully a full year on campus gives him more confidence when he steps on the court. His ceiling is as high as any player on the roster. Jamil Wilson: We have documented Wilson’s last two seasons in-depth with our Synergy breakdown, so take a look at that before continuing. Now in his senior season, Wilson finally gets his chance to play on the perimeter (almost) full-time. Because of that, his 3-point shot is something that can improve. He shot 36 percent from beyond the arc–a respectable number–and if he can boost that up to 39 or 40 percent OR increase his total makes at the same 36 percent clip, his numbers are going to explode. It’s a lot to ask since 36 percent is nothing to scoff at, but this is Marquette’s most talented player. He’s capable of doing it. Marquette needs him to be a star.